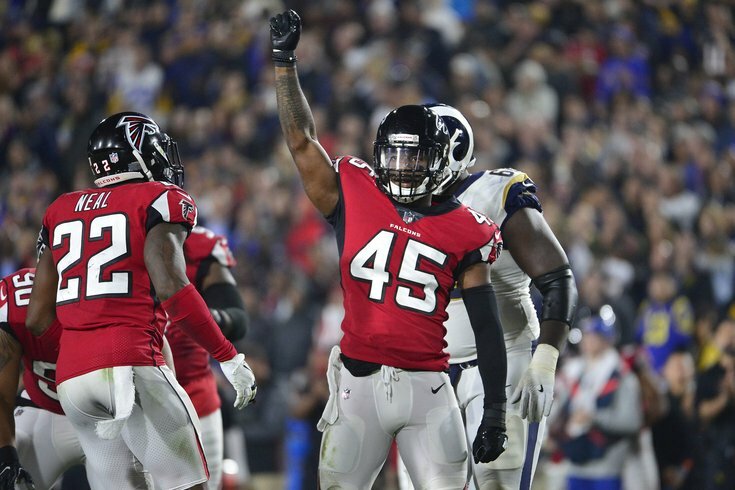 Falcons middle linebacker Deion Jones (45) during the second half of Atlanta's NFC Wild Card win over the Los Angeles Rams. Now that we know who the Eagles will be facing in the first playoff game of the Doug Pederson era – and that they'll make history as the first No. 1 seed to be an underdog against a No. 6 seed – it's time to start looking at who these two teams match up and why it seems like everyone outside of Philly is writing off the 13-3 Birds. After a weekend off, the Eagles will return to practice on Monday. But in the meantime, here's a look at what they're saying about the Birds' upcoming matchup with the Falcons, with an emphasis on the defense. Over at ESPN, each team's writer took a look at why they should be excited and why they should be concerned. In an attempt to be fair, I decided to look at the positive one for both the Eagles and the Falcons. Interestingly enough, there's a common theme throughout, one that also happens to be the overall theme of this edition of What They're Saying. I'd argue that the No. 1 reason for optimism in Atlanta should be "No Carson Wentz," but once again, it's the defense. The Falcons offense hasn't been anywhere near what was expected heading into the season. Nevertheless, they're one win from returning to the NFC title game, and that's due in large part to better-than-expected play out of the defense. It hasn't just been the defense either. The Falcons offense has been able to produce in a variety of ways. Put them both together, and the reigning NFC champs become a serious threat. There's no doubt the Falcons battled an identity crisis like most teams that lose in the Super Bowl — the true source of the so-called "hangover." The fact that they've fought to replicate their 2016 success while pivoting 180 degrees from offense to defense prove they are a complete contender. One of the things that has helped Atlanta's defense has been its offensive counterpart. By having a successful ground attack, they'll not only be able to thrive in any conditions, but they'll also be able to keep their defense off the field (and rested). Over on the Falcons team website, they took a look at how the two teams match up, specifically where each team might have an advantage on Saturday. They see Atlanta's secondary having the biggest advantage over the Eagles wideouts. As for their toughest matchup, they believe that will come against the Eagles tough defensive line.